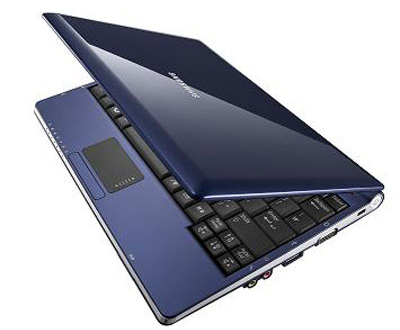 A year or so ago I bought my lovely little Samsung NC10 netbook and a 2gb RAM stick for it, and I have to be honest, it is basically the best £300 I’ve ever spent; I take it almost everywhere and use it most days (and on which I have composed most of this post). It’s amazing. So, the principle was there all that time ago, exactly how I wanted. A small, very portable computer that just computes. Seriously, how many times do you actually use a CD drive on a laptop these days, unless it’s the only computer you have? Most applications are either downloadable or can go on a memory stick and let’s face it, the humble floppy disk (sweet, noble floppy disk) – as lovable as it is – was always going to be replaced by something (Zip Disk anyone? No, didn’t think so). So, all you really need is the computer itself and some sort of network connection, and a USB port or two – and it only took 10 years for my wishes to become commonplace and affordable. Anyway, it’s brilliant, and as far as the variety of netbooks I have seen on the market are concerned, it definitely feels like it’s one of the better ones. It feels sturdy and well manufactured, the keyboard is a joy to type on (although Clare is positively disgusted that the keys are italicised. See what I did there? ), the screen is clear, and I much prefer the matt screen to a shiny one. The biggest improvements to be made would be the touchpad being made bigger and a longer battery life (although I am actually more than happy at around 6 hours) – both of which were addressed in subsequent revisions. As far as upgrading goes, it was as easy as you’d expect to pop in a new 2gb stick, and in anticipation of possibly hackint0shing it I’ve also swapped out the MiniPCI-express wifi card for a Dell one. Might even stretch as far as an SSD one day. So yeah, netbooks are awesome. Love using it, love having the ability to compute on the go, or just crack it out to watch a film on long journeys. Owning a netbook really is absolutely, totally and utterly joyous. Go out and buy one, you won’t regret it. I had a couple of old LaCie FireWire D2 CD-RWs knocking around which had been thrown out from work, and I had put them to one side on the basis that they might prove handy at some point, mainly with a view to cannibalising or reappropriating them. A couple of weeks ago, I finally found a use. Separately I’d had a growing concern of late about backing up some of my data, and had finally installed my old data drive, a 750gb SATA Samsung Spinpoint F1 HD753LJ, into a Maxxtor USB caddy I had acquired (What?! I’m a kit monster!) and set up my backup schedule, but it occurred to me that I could probably combine the LaCie caddy with the previous previous data drive, a 320gb IDE (not sure of the model without looking, to be honest), and donate it to Clare. What with her having a Mac, the FireWire made perfect sense. I set about stripping down the caddy, searched through my bits and bobs to find a 3.5″ to 5.25″ mount and put it all back together again. The drive immediately fired up in Windoze, but unfortunately, as a CD-RW. To be expected, I suppose. This rendered the setup useless, as writing to or formatting the disk was impossible. Never happy to be a quitter, (and secretly excited by the prospect) I decided there may be some way to reprogram the ROM to stop it thinking it was a CD-RW. In this respect I was really lucky. A couple of searches later, it transpired that the particular FireWire – actually, sorry. I have to stop there to make a point. Okay, quick sidetrack. FireWire, if you don’t know, is the Apple name for IEEE1394. I’m always torn between giving it what I see as it’s ‘proper’ name, IEEE1394 or even just ‘1394’, and FireWire. I’ve no overt love for Apple, but I do have love for standards, and they did do a lot of the pioneering work for said standard, and paved the way for its creation. Kudos. It’s arguably better than USB in many ways. Anyway, back to the plot. A couple of searches later, it transpired that this particular FireWire to IDE bridge (which as a generic component, are not that common) utilised one of the most widely used chips of its kind, an Oxford Semiconductors 911FW. Some instructions and a nice utility found in this brilliantly helpful post allowed me to reprogram the configuration information within the ROM to read any IDE device. Bingo. I duly changed the neccessary settings, uploaded them to the ROM, and restarted the system. It worked like a charm. The drive was up and running, and after formatting it to MacOS Extended, now serves as an external backup drive.